A relative new technology; GRIB-files are data-files collected from internet –or send to you with an email subscription on a regularly basis. These data-files contain weather data in a geographical grid, with predictions up to seven days. 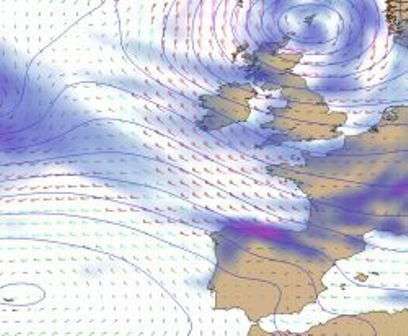 The predictions are made through computerised predictions software on mainframe computers by major government meteo offices; and than distributed through internet. 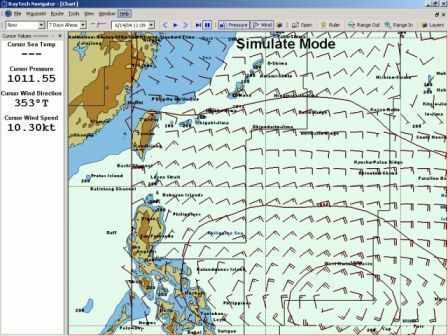 Weather parameters received can be wind, pressure, waveheights, swell, temperature, etc…. To view the data, GRIB-viewer-software is used, where the weather data are presented as an overlay to a geographical map, and can be animated in time, up to 1 week predictions. 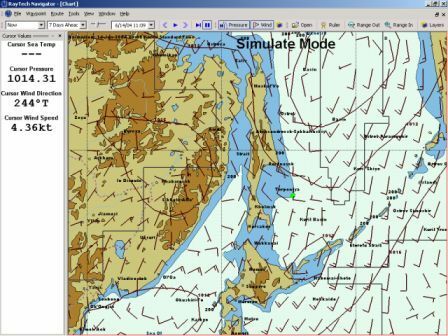 GRIBfiles with “Raytech Navigator” software; a view to Sachalin island, with an overlay of wind vectors and isobars. It is possible to zoom in / out, and animate the presented weather data up to a prediction of seven days. West Pacific: a typhoon is formed east of the Philippine Islands. This whole file is about 120 kBytes and contains data for wind and pressure for the next 7 days for the whole Western Pacific in high resolution and is delivered with a free subscription on a daily basis onboard the dredgers, throug email. To our experience, these predictions are awfully correct for the first 24-36 hours, and than tend to deviate somewhat for a medium term prediction. (e.g. Korea, Japan, Europe, …) giving a high quality input in the prediction software ashore, generating a reliable output for up 2-3 days. In remote area’s (like Sachalin), where input is less dense and less reliable, predictions are less reliable. The GRIB-data is generated with mainframe computers. When these computers are fed unreliable or less dense input, the output is accordingly unreliable. "Garbage in, is garbage out." The software is free available on internet, and grib-data-files are also send free of charge through email. Free grib-data however are mostly limited to windvectors and isobars. On “Gerardus Mercator” we run the “Raytech Navigator” (*) gribdata-viewer on a daily basis if making sea-passages or dredging offshore. The daily communication is handled through email, with satellite communications or mobile phone, and can be sized anything between 5 kBytes and 130 kBytes daily, depending on area coverage and prediction time and resolution. One can subscribe to a free daily datafile sent by email. On arrival of the email, one only need to doubleclick the file to open the software and start the animation to view a forecast for the next days; a fairly straightforward procedure. We tested more GRIB-software; but Raytheon proved to be the most handy as downloads of GRIB-files are possoble through email. http://www.grib.us/, a real smooth piece of kit, and it's freeware. (*) You will be hard pressed to find this particular software free on internet nowadays.